Habitat for Humanity is based on the idea that people need a hand-up, not a hand-out to upgrade their housing. Habitat works with people who have the desire to help themselves and others experience the dream of owning a home. Families who qualify purchase a home from Habitat with an affordable interest, no-profit loan. The path to home ownership begins with the Application and Selection Process. Once a partner family has been selected we celebrate the beginning of construction with a Groundbreaking Ceremony. 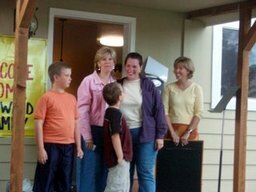 Upon completion, the partner family receives the keys to their new home at a special Dedication Ceremony. Donated items are tax deductible!